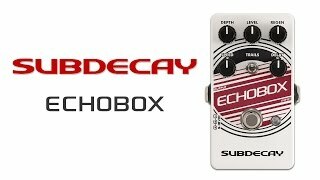 Start out with a great delay sound, add intuitive and useful features, and you have your self The Echo Box. The sound is somewhere between a digital and analog delay, but without the coldness of the the typical digital delay, or sometimes icky artifacts heard with analog delays. The repeats degrade each time they are recycled, but without any clicking, or popping often caused by “noise reduction” compandor circuits in older delays. Instead the Echo Box uses a discrete noise reduction circuit designed from the ground up. The modulation can be turned completely off, add just a little tape like warble, or push your tone to near insanity. Delay time is around 800ms. Infinite repeats are possible, and the scaling of the repeat knob can be altered via an internal trimpot.